It’s not my first choice on the menu…pancakes. I’m more of an eggs and bacon kind of guy. I know my wife loves them and I do like the idea of creating them, I love cooking! This past weekend we decided to take a few days off to enjoy the great outdoors. We packed up the truck with all our camping gear and headed north to Devil’s Lake in Wisconsin. The park was quite full so we camped at a nearby campground Mirror Lake, it’s quite the gem. We spent most of our first day setting up camp, napping, talking around the campfire and praying together – there is just something about getting away from your every day schedule that allows you to think more clearly and put the life that God has given you in perspective. We invited another couple to join us for the weekend. They are very close friends of ours and came up later that night after getting off work. It was a comfort and refreshing thing to spend an intentional weekend with another couple that re-energizes us and gave us all an opportunity to minister to one another. After a long day of hiking and rock climbing the cliffs at Devil’s Lake we ended the evening with chili over the campfire. 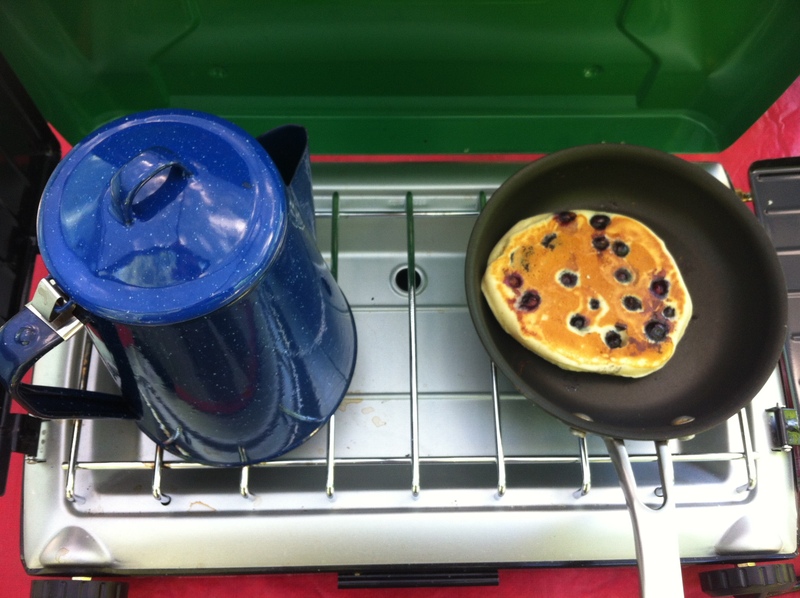 The next morning I put some coffee on and then proceeded to make some thick, fluffy, blueberry pancakes. I did have my eggs and bacon but also threw down a giant blueberry pancake! It was perhaps the best pancake I’ve ever had…and a new favorite. 1.) GO CAMPING. Maybe you aren’t the happy camper…but do try to get away from everything – including that cell phone. Throw the normal schedule out the window for a couple of days…enjoy the adventure! 2.) TIME WITH FRIENDS. Great friends are priceless. Find them and keep them close – they can be your greatest boost of energy while serving in full-time ministry. 3.) EAT BLUEBERRY PANCAKES. More specifically, try something new whether it be a new food, a new exercise routine, or book series. You never know…you just might like it!